This summer, I had the chance to visit one of my oldest friends from middle/high school. Amy and I have seen our share of ups and downs over the past 15 years and I was really happy for the chance to reconnect after a few years of not seeing each other much. 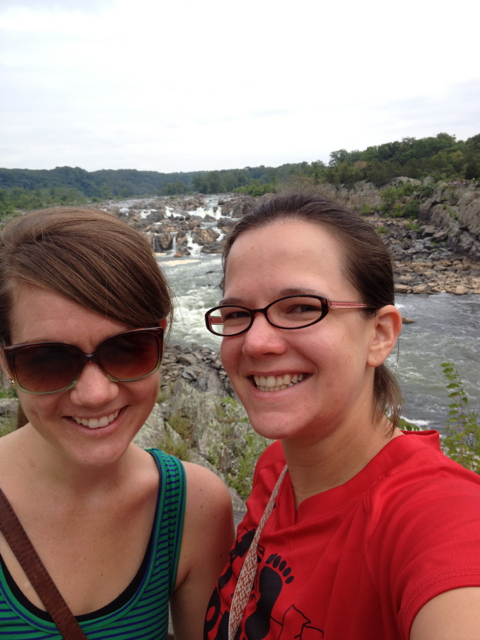 We had a lot of fun including fancy dinners and drinks, jazz in the National Sculpture Garden, and a hike at Mathes Gorge. On my last day in town, we spent the morning brunching at a little French cafe and then cruising the Eastern Market for ingredients for an evening grill out on the patio. The Eastern Market was great with lots of fresh food to choose from. 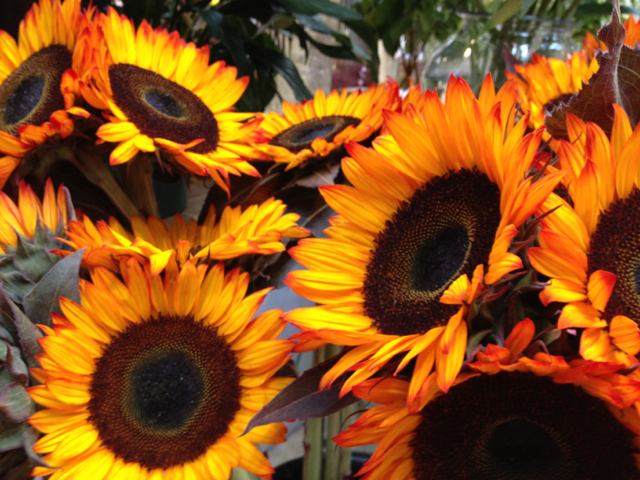 I just wanted to include a picture of these sunflowers because I thought they were gorgeous. And these’s no filter on that picture. For dinner, Amy grilled the chicken sausages. We ended up with a couple different flavor combinations and I don’t remember exactly what they were, but they tasted great. 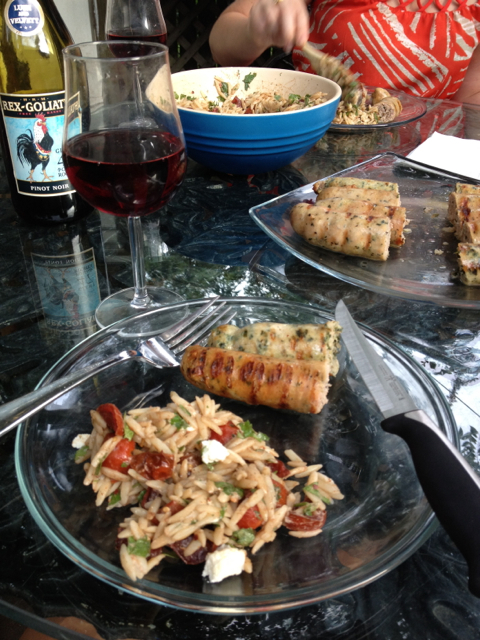 The sausages were served with orzo salad and wine. – Boil a cup of orzo until al dente. – Halve a pint of cherry tomatoes. Saute them in balsamic vinegar until the tomatoes are soft and the vinegar is reduced to and syrupy. 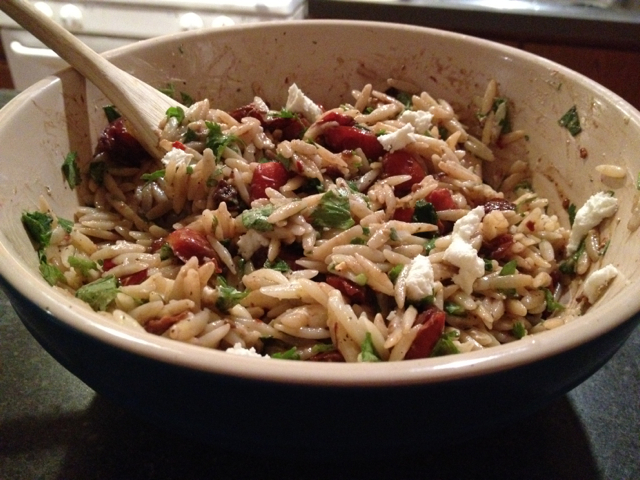 – In a serving bowl, combine the orzo and tomatoes. Stir to combine and allow to cool slightly. Add two handfuls of roughly chopped parsley. Before serving, top with crumbled goat cheese. This can be served at room temperature and I’m sure the leftovers would be delicious refrigerated.